Where are the 7″ Microsoft tablets? A few days ago I was contemplating a blog post with my speculation about a 7″ Microsoft tablet when rumors of an “Xbox Surface” re-surfaced. I tend to believe this rumor because I’ve been expecting that a portable Xbox family member would appear, something I discussed back in a March 2011 blog posting. Seems like I speculated on the wrong specific solution but may have gotten it right on the strategic side. Anyway, the reason I was thinking about this topic was Windows marketing chief Tami Reller’s comment that there were no 7″ Windows tablets on the way. Given that this area is exploding, and has now been legitimized by Apple, I was wondering how Microsoft could ignore such a high-volume market segment. Doing so is incredibly risky since a customer buying into one of the other ecosystems with a 7″ class device is somewhat locked in to that ecosystem going forward. Or if you follow the MpD theme I’ve been on then the way to look at this is that not having 7″ class devices can dramatically reduce the Minutes per Day of Windows use. I don’t think Microsoft is stupid enough to let 100s of millions of MpD sucking devices enter the market unchallenged. So what could Microsoft’s strategy be? Long-time readers know of my fondness for the Content Consumption-Content Creation axis for understanding devices and it makes sense to use it here. Microsoft’s strength and strategy for differentiating Windows 8/RT is its better content creation capabilities than either IOS or Android. Meanwhile 7″ tablets are deep into the pure content consumption device space. So it makes sense for Microsoft to target the 10″ and above class devices with Windows 8/RT and avoid taking it, as is, down into the 7″ class where it loses its differentiation. 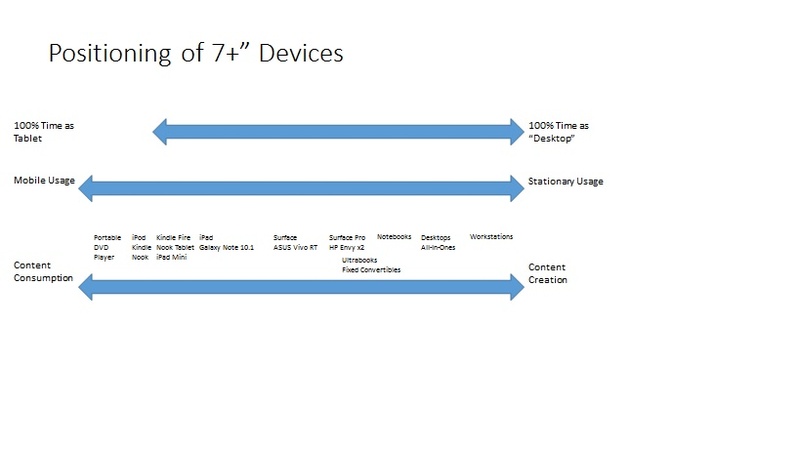 With this in mind my assumption became that rather than produce a “pure” Surface in 7″ that Microsoft would pursue a more customized content consumption device to play in this category. It would be based on Windows 8/RT, but be marketed quite distinctly. My own thinking had focused on the partnership Microsoft has with Barnes and Noble around the Nook. We still don’t know what is expected to come out of the Barnes and Noble partnership, but it is clearly something bigger than just getting a Nook app for Windows 8/RT. I’ve been expecting a Windows RT-based Nook that is B&N branded and sold and/or a Nook Surface that is Microsoft branded and sold. And have been expecting that such a device would combine the Nook ebook offering with the Xbox Music and Video services to create a Kindle Fire (and its ilk) competitor. I still think this likely. The question now becomes what are all the components of a Microsoft assault on the 7″ class tablet space. Could we see multiple 7″ class consumption oriented devices or will there be just one? Put another way, is there a Nook Surface and an Xbox Surface or is an Xbox Surface Microsoft’s all-encompassing vision of what a 7″ device should be? As they have done with the Surface, making content creation a differentiator, Microsoft’s vision could be to differentiate in the 7″ space by focusing more broadly on entertainment than purely on content consumption. Certainly that’s what being part of the Xbox family implies. Perhaps an Xbox Surface is the device Microsoft offers while B&N offers a Nook RT. Microsoft would focus on the more premium offering, pricing it more like the iPad Mini, while B&N would focus on the price sensitive segment of the market pioneered by the Kindle Fire. Squeezing on a market segment from both the top and the bottom is a classic way to attack entrenched competitors, and for once Microsoft might be well be positioned to do this. What of the OEM community? Do they play in the 7″ class? Does it matter? In what most of us think of as the big war going on in the 7″ space it probably doesn’t. So the question becomes what other market niches might a 7″ Windows RT-based tablet address? Are their places where a very business-oriented 7″ tablet makes sense? What about using a 7″ device for going after emerging markets? The former might be a small niche, the latter a very large (but so price sensitive it is not very profitable) one. I can see Microsoft encouraging OEMs to address these areas, but perhaps wanting to give Windows RT some time to establish itself in its primary market before risking dilution of its positioning. I expect Microsoft to enter the 7″ class device space with a content consumption, and perhaps broader entertainment, optimized device sometime in 2013. Until this week I would have bet on that being a “Nook Surface”, but rumors of an “Xbox Surface” make even more sense. If done right it could be a real game changer. This entry was posted in Computer and Internet, Home Entertainment, Microsoft, Mobile, Windows and tagged 7" Tablet, Microsoft Surface, Nook, Nook RT, Nook Surface, Surface, WIndows RT, Xbox Surface. Bookmark the permalink. 11 Responses to Where are the 7″ Microsoft tablets? I don’t see how Xbox can afford another breakeven or worse device. E&D is already under pressure given the rapid deterioration in console sales, and the decline in PCs leaves the rest of MS less able to subsidize losses than they used to be. The B&N Windows-based device I can see. The Xbox one, unless it’s the next console itself, is less obvious. What MS does may end up being dependent on how Surface itself does. If it doesn’t meet their numbers, or warranty claims end up chewing through any profits generated, I don’t imagine they’ll be too keen to go into an even more price-sensitive part of the market. Microsoft is in transition. That transition, if we are to believe Steve Ballmer, to a “Device and Services” company. If they are truly going to be a devices company they’ll have to accept a decline in margins, at least in the short term. And one of the things that history will judge Ballmer on is how he managed that transition. But there is no evidence, none, that margin pressure will be so severe as to make a dent in Microsoft’s ability to fund things like Surface. The cash keeps pouring in. And investor behavior the last decade says that they care more about Microsoft putting forth an exciting and compelling story for the future than they do about near-term profitability. If necessary I think they could get away with shrunken margins for a couple of years, perhaps permanently, as long as investors believe they are on path that puts them back at the top of the technology industry leadership pack. IEB (E&D is long gone as its parent entity) appears to be working on three devices. A full-on Xbox 360 replacement, an Xbox-light to better go up against Roku/Apple TV/Google TV/etc. for people who aren’t heavy gamers, and the Xbox Surface. That explains why over the last few years they have grown the team and absorbed an enormous number of senior people from around the rest of the company. Do they view any of these devices as “break even”? I doubt it. They are all part of a Device plus Services business model that is supposed to be profitable. Will they have near term startup costs that hit IEB margins for a year or two? Definitely. Will they eventually be profitable, hopefully more profitable than the current Xbox 360 business? Good question. But overall I don’t see too much of an option for Microsoft. Xbox is a key asset, and the main unique capability, they have in going up against Amazon and Apple in the entertainment space. They can’t yield the space and win with consumers. They can’t win the space without new compelling and competitive products. I don’t think reverting back to sustained losses in Xbox and its division would be well received by investors or analysts. It’s never been a popular investment with the latter and it would be even less so today, especially with the large losses in Online and MS struggling just to hold its current EPS and valuation as the “Post-PC era” bites into PC growth. Surface can get lost in Windows still large (but declining) numbers. A 7″ Xbox tablet in IEB can’t, particularly not when paired with a new console. My sense is Ballmer and the company are running out of time. What investors put up with in the past, when MS was still growing decently, isn’t a good analog for what they’ll put up with in the future if/as that comes to an end. In fact if Windows continues to decline and Office joins it, I could see Ballmer being forced to rethink both EIB and Online – or risk being replaced by someone who will. After playing Xbox Forza Horizons using my Surface and Smartglass, you wonder if the ‘Xbox Surface’ could replace the standard Xbox controller. Yes, it would be an expensive controller, but it opens up a lot of interesting possibilities. It also competes against the new Wii U.
They’ve also just done a model refresh and have new 7 and 9 inch tablets out, so it’s unlikely that we’d see anything for at least another year. And while they’ve had a very restrictive set of apps so far, it’s still going to cause ecosystem disruption for them to shift over to a completely incompatible app market. That could really hurt them against Amazon, which is, I am sure, a much bigger concern for them than whatever Microsoft might want to be doing. They could still do it anyway, especially if Windows 8 takes off quite well in the tablet space, as the differentiation could be a good thing for them, but there seem to be a number of good reasons why they wouldn’t want to. Are you forgetting that Microsoft and Barnes and Noble are in a legal battle over B&N’s use of Android? It’s unlikely that the two are going to jump further into bed at this point. The battle ended months ago with the Nook and academic book business turned into a separate subsidiary that Microsoft has partial ownership of.